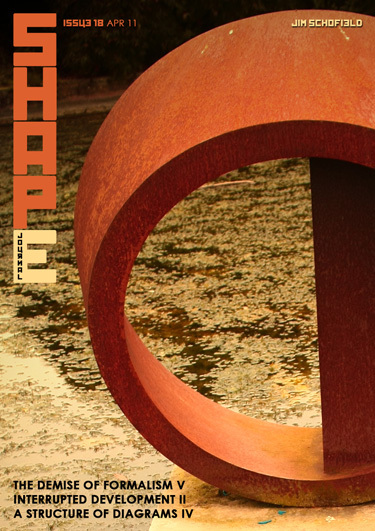 Welcome to Issue 18 of SHAPE Journal. In this issue of SHAPE Journal we carry on with the next instalments of both Interrupted Development & Bursts of Creation, and The Demise of Formalism. There has been something of a lull in the publishing of normal issues over the last couple of months, but this has been caused by the involvement of a whole flood of Specials, including two very important ones on The Big Bang and The Origin of Life on Earth, so these have suspended normal service, which is now being resumed. These Specials are now ready and will be published in the very near future. But, the single wholly new Paper in this issue is yet another extraction from the book A Structure of Diagrams. This is a paper that gets to the heart of that book, for it shows an interesting type of diagrammatic form, which is that which assists in the solution of problems. We are used to diagrams that are designed to explain – a means of communication between an author and his readers. But the diagrams included in this paper are for a researcher communicating with as yet unsolved content, and facilitating new ways of seeing and solving difficult areas. This example was concerned with tessellations of re-entrant figures in Three Dimensions, and will, no doubt, delight any mathematicians among our readers. Also, it is perhaps a good time to mention a paper, which will commence in Issue 19. Our new policy of regularly producing Reviews on our Blog is continuing with the pieces mentioned above. So this will indeed continue to happen at regular intervals from now on. Read and enjoy, and if moved to do so, react! Send us your views for publication in the Journal. We look forward to such reactions as they inform us of what our readers require. Left to ourselves we will not necessarily produce from our prodigious store of work in the best possible order.